Crunchy, nutty, spicy and delicious! This salad will be a new favourite in your recipe repertoire. 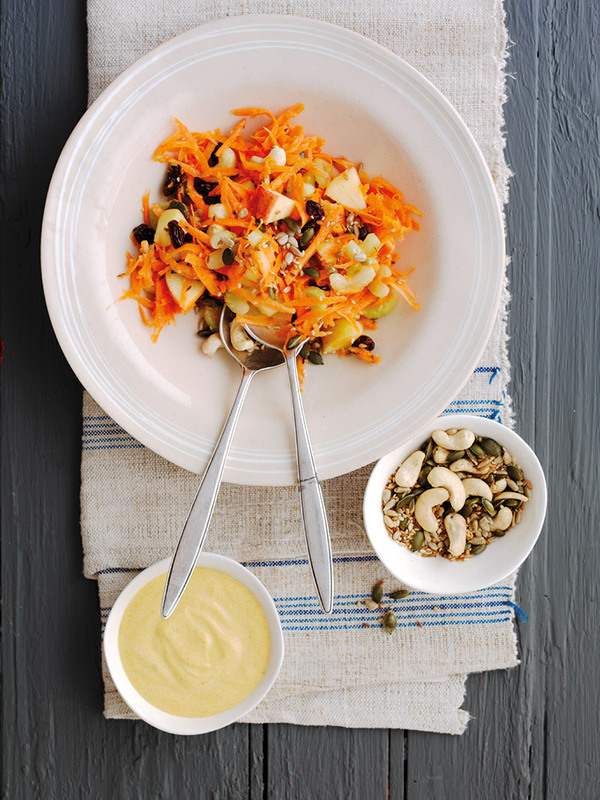 Put the grated organic carrots into a salad bowl and add the apple, cucumber and celery with the raisins or sultanas. Stir in the lemon juice and sesame oil or olive oil. Heat a non-stick frying pan over a medium-high heat and add the nuts and seeds, stirring them to toast for 3-4 minutes to bring out their flavour. Cool, then add them to the salad bowl and toss them through. For the dressing, mix together the yogurt and turmeric with a pinch of salt and pepper. Serve with the salad and garnish with coriander or flat leaf parsley. Cook’s tip: Add some finely shredded kale or cabbage to go towards your 5-a-day intake. Use organic ingredients where possible.